In Sussex there are two opportunities, at bank holiday weekends, to run three races in three days. The harder challenge occurs in the spring, when the foolhardy may run the East Grinstead and Haywards Heath 10 mile races, and finish off with the Burgess Hill 10k. The three together make a marathon, more or less. I, on the other hand, chose the less challenging August treble, consisting of the Alfriston Water Meadows Fun Run, a little over 5k off-road, the Newick Will Page 10k and the King’s Head Canter, a 5k, a total mileage of a modest 12.69. Nevertheless, given my aversion to road running and to running on consecutive days, I approached the races with caution. The Alfriston race, part of the village’s festival, starts and ends on the Tye, and runs along the side of the Cuckmere. Though short, about 5.4km, it is not without its challenges: rutted paths, cows and their by-product, stiles and annoyed ramblers who did not appreciate having to wait to climb the stiles. In small fields, slower runners like me feel exposed, but I could see, as the leaders returned along the opposite bank, exciting duels between the first, second, third and fourth runners, all Seaford Striders. Ben Martin, a junior won, with Gareth Hutchinson in second place and Paul Heywood in third. The menacing clouds above us produced only a drop or two of rain, and we returned to a prize-giving interrupted only once by the Eastbourne Scottish Pipe Band. The Newick Will Page 10k is a bigger event, run on country lanes around the village, beginning and ending at their sports field. The first half is broadly downhill, so the laws that govern the universe dictate that the second half must be uphill, and the final kilometre is particularly hard. When I ran it before, the pain was enhanced by being able to hear the loudspeakers calling the finishers home long before I was anywhere near the finish. This year, perhaps because of a cricket match that was to be held on the field later on, the loudspeakers were silent, so that particular mental torture was denied me. Finally, in heavy rain, there was today’s King’s Head Canter, a new race for me. It begins in Chiddingly, the village where Picasso used to come to stay and finishes at East Hoathly, at the King’s Head where the 1648 brewery, named after the year when we executed Charles Stuart, that man of blood, is based. The brewery sponsors the race and generously gives every finisher a pint or soft drink if they prefer. The race poses a logistical problem, solved by leaving one’s car either at the start, and then walking back over the fields to Chiddingly after the race, or leaving it at the finish and walking across fields before the race. I chose the latter course, and confidently set off on what I thought was the path. I was followed by other runners, a mother and her two daughters, deceived by my air of knowing where I was going. I had to admit that I had taken a wrong turning, and we retraced our footsteps, but though I was sure I now knew the correct path, they unaccountably preferred to drive to the start rather than trust my way finding again. Waling two miles across wet fields is not recommended, if one wants to start a subsequent running race dry-shod. We assembled for the start and were off. 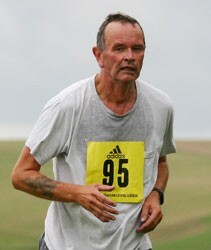 I found a good pace and stuck to it and, much to my astonishment, found I was overtaking other runners. There were a few downhills but no corresponding ascents and I was pleased to finish in, by my watch, 27:51. I await the official results. Then I joined the damp queue for my free pint: I chose the lightest beer on offer, Hop Pocket. It lived up to its name. Yesterday I ran to High and Over and back, a short run of just over an hour, as prescribed by the training programme. Since I'd held last Sunday's long run over to Monday, I have a better weekly total mileage than usual, 23.83 miles. Next weekend, the August bank holiday, will be a three-run affair, with the Alfriston Watermeadows Fun Run, the Newick Will Page 10k and the King's Head Canter. I don’t have a great deal to report; a gentle #parkrun yesterday though unrecorded, as I forgot my barcode — I was 141st, so therefore somewhere between 27:05 and 27:12. I thought, though, that I should itemise my planned races for the rest of the year. On Wednesday, with several other Seaford Striders and a new pair of running shoes attached to my feet, I went to Bexhill for the Bexhill 5K, the last in their series of three summer evening races, and, unlike the other two, part of the Sussex Grand Prix. We could see Eastbourne Pier burning across the bay as we ran the westward sections of this two-lap race, much as the inhabitants of Naples must have looked across the bay at the destruction of Pompeii and Herculaneum. I was pleased to record a time of 27:33. By way of contrast, this morning I ran the Friston Forest 5 mile, a small event near my home. As I arrived at the forest mist was rising from the trees, and I found the race headquarters in a small glade off the Litlington road. I had originally entered the Adder, a ten mile event, but traded down to the five miler, in view of my lack of training. The organisers were genial and relaxed, and there cannot have been more than fifty runners milling around, though they all looked faster than me. At 9 the Adder runners set off, and we followed them five minutes later. Possibly the hardest part of the race was the first hill; after that taxing ascent, I settled into a rhythm and followed paths, some known to me, some unknown, through the forest. The sun shone on us, the hills were agreeably taxing and, to my surprise, in spite of their appearance at the start, I was not the very last runner. Indeed, as I fell down the hill to the finish in 52:51, I began to regret my decision to change from the longer distance. I shall be back.